Ben Luc – Long Thanh Expressway Project is evaluated as the highest total investment in the South of Vietnam. After completed, it will be a direct alignment from the West and the East of the South to the expressway and highway network without crossing Ho Chi Minh City central. This is the busiest commercial transportation route linking major infrastructure system including Hiep Phuoc Marine Port, Thi Vai – Cai Mep Port and Long Thanh International Airport. The project plays an important role of promoting the development of key economic zone of the South; especially of Ho Chi Minh City, Long An and Dong Nai provinces. By shortening the travelling time, goods and public passenger transport from the Southwest provinces to Ho Chi Minh City and the Southeast provinces will be more quickly and conveniently, reducing the traffic pressure of NH No.1 and NH No.51. Scope of Project: The starting point is at the intersection of HCM city – Trung Luong Expressway and Ring road No.3. The ending point is the intersection with Bien Hoa – Vung Tau Expressway. In phase I, the ending point is at the interchange with NH No.51 (Km35+350 of NH.No51). The project crosses Long An Province (2.7 Km), HCM city (26.4 Km) and Dong Nai province (28 Km). The project is designed in accordance with expressway class A standard, maximum designed velocity is 120 km/h. In phase I: 04 lanes, 02 emergency parking lanes, embankment width is 27.5m. In phase II, 04 lanes, 02 emergency parking lanes, embankment width is 42.5m. Total Investment: Phase I: VND 31,320 billion VND (USD 1,607 billion), in which the loan of Asian Development Bank (ADB) is USD 636 million, the loan of the Japan International Cooperation Agency (JICA) is USD 635 million and Vietnam State budget is USD 337 million. 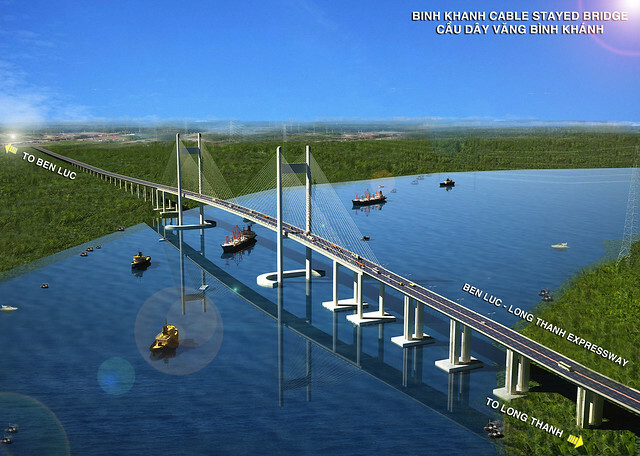 – Binh Khanh Bridge: Double-planes cable-stayed bridge; width is 21.75m; tower height is 155m from foundations; main span: (187.25 + 375 + 187.25)m; navigation clearance is 55m and L = 242m; approach bridges are balanced cantilever bridges with 70m-length span. 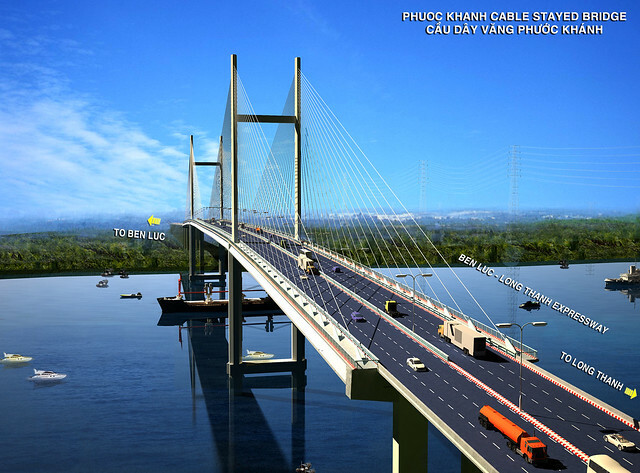 – Phuoc Khanh Bridge: Double-planes cable-stayed bridge; width is 21.75m; tower height is 135.8m from foundations; main span: (149.5+300+149.5)m; navigation clearance is 55m and L = 242m; approach bridges are balanced cantilever bridges with 40m-length super T girder. • Other river-crossing bridges: 09 bridges with 4,827m in total length. • Viaduct: 02 viaducts crossing residential areas, 2,149m in total length, 03 viaducts combining with irrigation-crossing bridges with 8,416m in total length. • Soft soil treatment: Almost the route goes through soft soil areas, so many technologies of Soft soil treatment are applied, such as soil replacement, PVD, sand drain, deep mixing materials (DMM), approach slap, etc. The total length of soft soil treatment is approximate to 21km. • Culvert: 73 underpass, drainages and technical culverts. • Service – operation: Intelligent Transportation System (ITS) with 01 Control center, 06 toll plazas, 02 operation house and 02 service areas.